My opinions on the issue of cane toads. A note to herp (reptile and amphibian) hobbyists. “Swallow a toad in the morning if you want to encounter nothing more disgusting the rest of the day” – Nicholas Chamfort. Frankly, I disagree. Toads are wonderful. Even cane toads. I don't blame cane toads for ecological problems. In case I hid my affliction well, I’ll admit right now to being a frog freak. I gave up fighting the froggish-addiction when I was young. I keep various species; their planted terrarium is wider than my bed. They sometimes sing to me...well, not to me...really they're just singing to that lovely lady frog whom they just know is somewhere out there waiting for them -- I am just the unfortunate innocent bystander who's trying to get some sleep! I find all Anurans to be fascinating. Even the cane toad, with all the ecological problems for which it is blamed in exotic locations, is incredible: it has proven its ability to out-compete most other organisms and has seemingly won the evolutionary Olympics. Without a doubt, the exotic presence of the cane toad is a tremendous problem. However, the fault is not with the toads (who are simply doing what nature taught them to do best), but with humans. Humans are at fault for introducing this species to new locations, where other species had not evolved with the toad and thus could not compete. It is true. In its native locations, the cane toad isn't problematic– the ecosystem and food chain have evolved with the toad, and so the toad has predators to keep the population in check. In order to save the ecosystem in places such as Australia, exotic cane toads must be wiped out. Still, the efforts must be undertaken humanely, and by professionals. Efforts by well-intentioned but untrained individuals to exterminate cane toads are killing native species. You can best help the ecological cause by supporting or volunteering with government and reliable non-profit programs. If you live in areas where there are toad "drop off" sites, where professionals will identify and then euthanize actual cane toads, utilize such programs. You can also help by supporting amphibians worldwide -- if you haven't done so, read Anuran Populations. If you’re mad about the cane toad problems, I am too; I just remind myself to blame humans rather than the toads that we introduced. Their problematic presence is the fault of humans! They just took the opportunity presented. A note to herp hobbyists: If you keep amphibians as pets, make sure that you buy only captive-bred animals that are in good and healthy condition. Do not support business ventures that disrespect animals by treating them as commodities rather than as living creatures. Furthermore, ensure that you have the knowledge, time, and financial ability to care for any pet that you do acquire. Did you know that amphibians need special lighting, sometimes heat (but not heat rocks), and that if they are only fed insects, that they will have serious calcium deficiencies? Of course, the overuse of mineral supplements can result in kidney failure, and metabolic requirements vary over the lifespan -- so you have to know what you are doing. Amphibians also may have specific humidity requirements, and tap water is lethal. Finally, consider mental health: I believe it is inhumane to keep an animal in an environment which stresses the animal. This may be due to the absence of natural features such as plants, the accumulation of filth, an overpopulated environment, or the presence of excessive noise, drafts, o r smoke in the house. Please consider your readiness to house an amphibian before you bring it home. They are living creatures, and as such, they deserve respect! 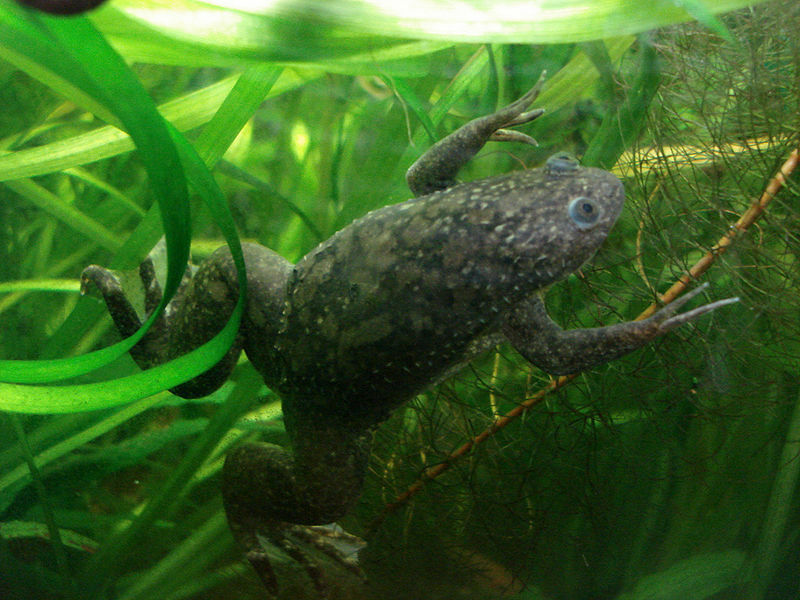 (And do not dare think of releasing an unwanted pet into the wild; I could have done a website on the similar issues resulting from the African clawed frog, Xenopus laevis! That species is pictured to the right. If you've suddenly got the urge to catch flies with your tongue, I am concerned about you, but would love to hear from you. I welcome your comments, concerns, or questions. I'm off to grad school, so Contact me at megutierrez@dmu.edu. Finally, the mystery. I love anurans and thus must recommend another anuran for your learning: Do you know what an Agalychnis callidryas is? Find out here. Or, if you're still stuck on the cane toad, check out additional info: resources.